LOT Publications Webshop. Authorial or Scribal? Chaucer’s Canterbury Tales has come down to us in about 80 fifteenth­century manuscripts, none of which is in his own hand. What is conventionally referred to as ‘Chaucer’s language’ is the language found in two early texts of The Canterbury Tales, the Hengwrt and the Ellesmere manuscripts. Despite the fact that these manuscripts were copied by the same scribe, traditionally known as Scribe B and recently identified as Adam Pinkhurst, they are characterised by significant spelling differences. This dissertation is an analysis of spelling variation in Hengwrt and Ellesmere, supplemented by comparisons with three other texts copied by this scribe, i.e. three quires of a manuscript of Gower’s Confessio Amantis, a fragment of the Prioress’s Prologue and the Prioress’s Tale and a fragment of Troilus and Criseyde. Comparison of spelling variants in all fifteenth­century manuscripts of the The General Prologue, The Miller’s Tale, The Wife of Bath’s Prologue and The Nun’s Priest’s Tale was made possible by the digital tools recently developed by the Canterbury Tales Project at the University of Birmingham. The results of the present study show that spelling differences between Hengwrt and Ellesmere are not due to changes in Scribe B’s spelling habits, but to his different approach towards the two texts. Hengwrt is a manuscript produced to collect all tales in one codex, whereas Ellesmere is a more prestigious version of the same work. The spelling in Hengwrt is probably more faithful to the original version, while in El the scribe appears to have normalised the spelling in accordance with his interpretation of what he assumed to be Chaucer’s orthographic habits. 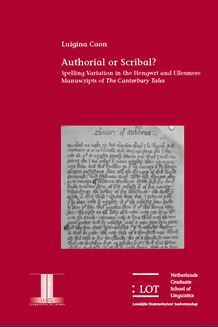 These findings will be helpful to scholars interested in doing further research on the spelling of the Hengwrt and the Ellesmere manuscripts, and more generally on Chaucer’s language.